As Esther K. Choy realizes full well, a great deal of very hard work must be invested in the development of material before it is then organized and presented within a narrative framework. Otherwise, the storytelling process lacks both substance and significance. So the title of her book is somewhat misleading. That said, she provides in her book an abundance of valuable information, insights, and counsel that can help almost any reader to strengthen their skills in each of what Aristotle characterized (in Rhetoric) as the “four levels of discourse”: exposition (explaining with information), description (making vivid with compelling images), narration (telling a story or explaining a sequence), and argumentation (convincing with logic and/or evidence). It is no coincidence that most of the great leaders throughout history were brilliant storytellers. How the given material is organized and presented will depend, of course, on two key factors: which approach to take, and, what will be of greatest interest and value to the given audience. Abraham Lincoln used humor to diffuse anger and reduce opposition whereas Martin Luther King shared his dreams in order inspire others to help make those dreams come true. Although Esther Choy focuses primarily on the business applications of the basic storytelling principles, strategies, and tactics, I presume to suggest that almost all of them can also guide and inform the process by which we can function much more effectively in non-business situations. That is, situations in which the question to be answered or the problem to be solved or the case to be made is unrelated to business issues. Teaching offers almost unlimited opportunities as do competitive athletics. 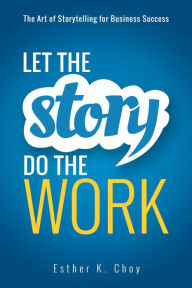 Yes, it is possible to “let the story do the work” but only after the given material has substance and significance. Thus viewed, the art of storytelling is relative to – and this book is relevant to — almost any situation in which the objective is to achieve success in one form or another.